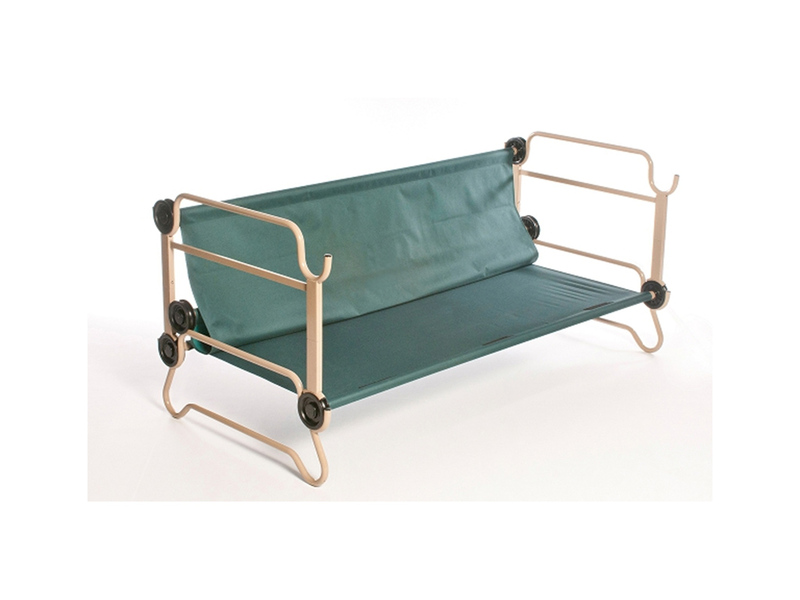 Disc-O-Bed's™ Cam-O-Bunk XL cot system is packaged in two canvas bags, each housing one cot (half the sleep system). 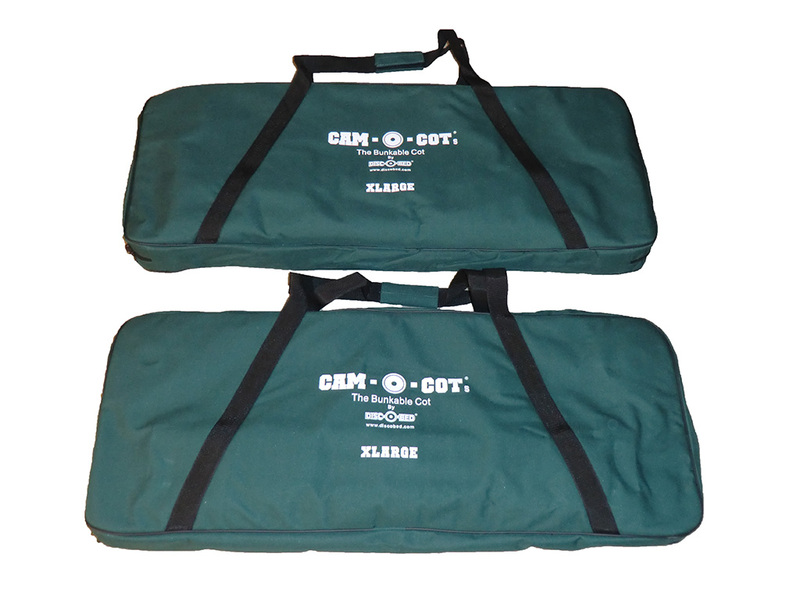 The storage bags have carry handles and seem to be well made and durable enough for long term use. They also have designated spots for storing each of the pieces, making it easy to set up and then store after use. 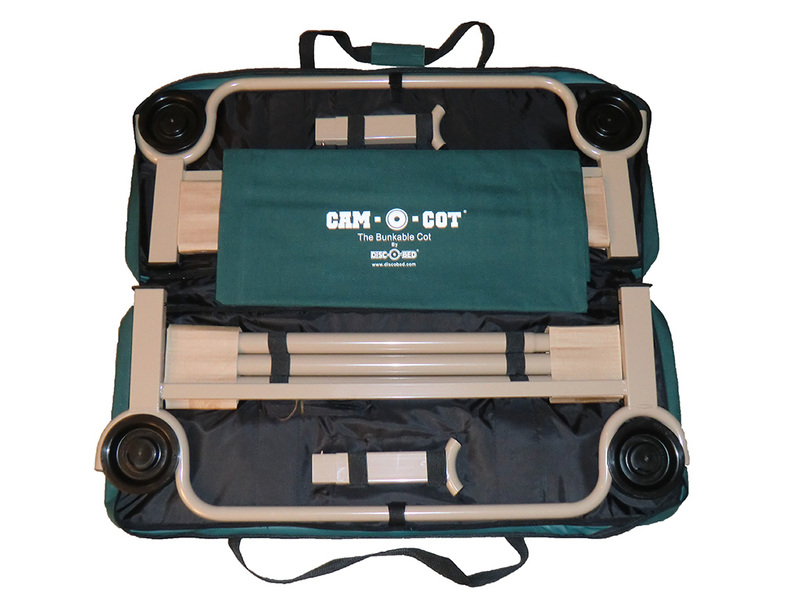 I first set up the Cam-O-Bunk XL cots in my family room. I barely glanced at the instructions and had the beds fully set up in under 20 minutes. I am very impressed with the ease of assembly. The materials all appear durable and heavy duty (makes sense with a 400 pound rating per cot). The actual cot decking material seems very taught when first assembled, but stretches to gently and comfortably cradle one's body. I found it very comfortable to lay on (both the bottom and top bunk). There is ample room above the bottom bunk, but not enough to sit up. Getting in and out of the bottom bunk requires a combination of sitting up and rolling to the edge of the cot. It is pretty easy after the first try. I only noticed two issues with the Cam-O-Bunk system. First, I noticed that the bottom bunk I received is exactly the same as the top bunk. 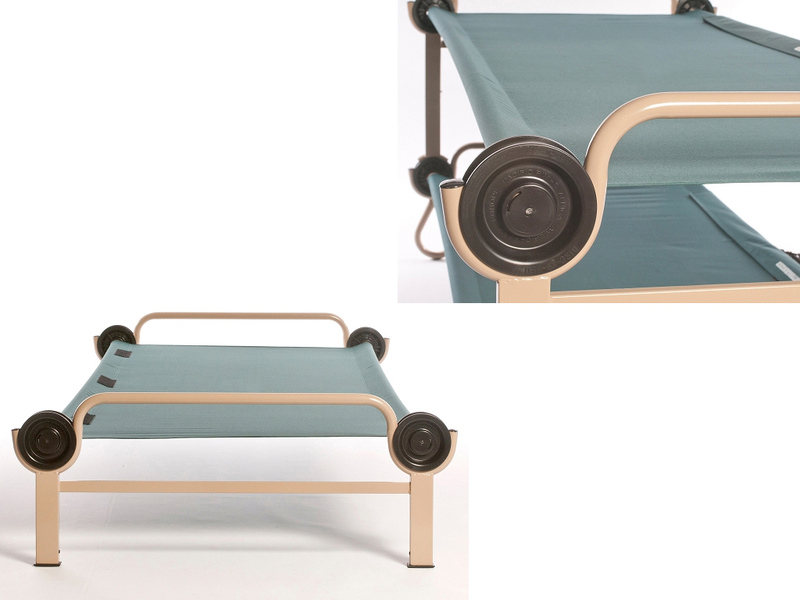 It does not have the rounded bottom frame as pictured on Disc-O-Bed's™ website. It still works great and is very sturdy, so I do not have any worries. When using it in a tent, I would just put down a strip of plywood under the front and rear legs to distribute the pressure. The other issue I encountered was the hook-and-loop closure safety straps (to secure the front and back frames when bunked) came un-stitched on one strap. Luckily the straps also have a buckle, so they still function without the hook-and-loop piece. I contacted the manufacturer and they quickly remedied both issues by sending replacements. I was very impressed with Disc-O-Bed's great customer service! Since it is winter, and the mountains here in the Pacific Northwest are snow covered, my first overnight test of the Cam-O-Bunk XL bunk bed cots was in my backyard. I was simultaneously testing a couple mummy bags, so the bunk cots made it convenient for putting a different bag on each cot. It took me just under 15 minutes to get the cots set up. I first slept on the bottom bunk and switched half way through the night to the top. 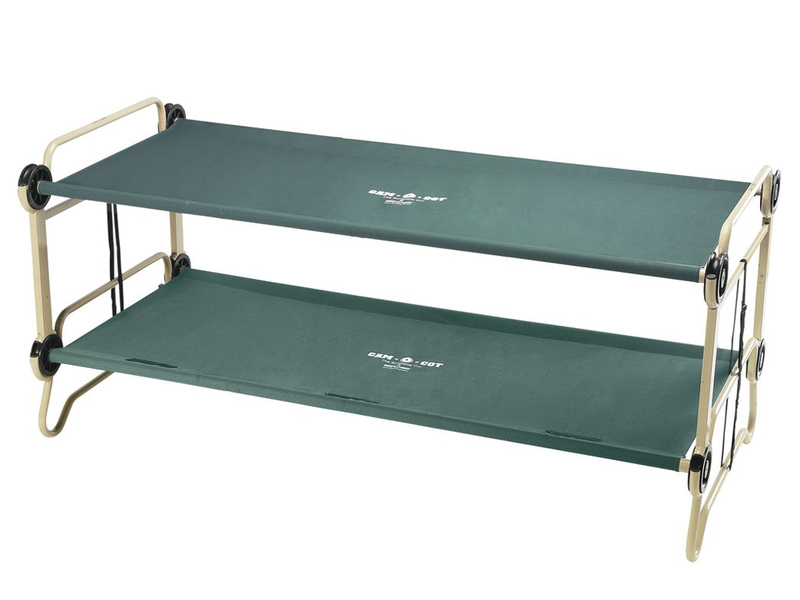 I found both the bottom and top cots to be equally comfortable (on par with any air mattress I have ever used). I also found it easy to get on and off both the top and bottom cots in the dark. The temperature held steady in the upper 30's F all night during my test. I noticed the cots do not insulate in cold temperatures, but I wouldn't expect them to. It would be easy enough to add a foam insulating pad to either cot. I think the Cam-O-Bunk XL bunk bed cot system will work great while camping and also at home when guests need an extra place to sleep. I look forward to using them again. Special thanks to Disc-O-Bed™ for providing the Cam-O-Bunk XL Portable Bunk Bed Cot System for review.